Hound’s tongue is a biennial weed; the erect stem, 1-3 feet high, bears alternate, sessile, lanceolate leaves that are downy on both sides. 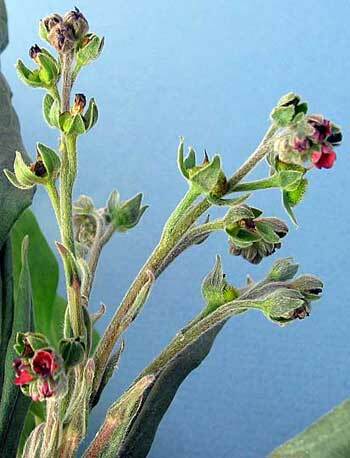 The basal leaves are similar but have petioles and are shaped somewhat like a dog’s tongue. 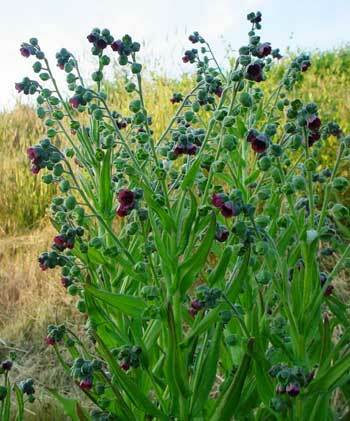 The reddish-purple or lavender flowers have funnel-shaped corollas and grow in curving racemes from May to September. The bruised plant has a disagreeable, mousy or musty odor. Another variety: Virginia mouse-ear (C. morrison) is a related annual plant similar in appearance to hound’s tongue but with white or light blue flowers. The root is an effective astringent. Grows in waste places, in sandy, rocky soil, and along roadsides in the states north and east of Montana and Kansas, as well as in Europe. Webster’s Dictionary claims hound’s tongue is of the Borage family; some references state it should be the Forget-me-not family. Legend has it that if the leaves are laid under their feet, it prevents dogs from barking. Hence the name. According to The Herbalist Almanac, if hound’s tongue is gathered when the sap is full of vigor, bruise it with a hammer and lay it in the house, barn or granary that is infested with rats or mice. The rats and mice will “shift their quarters” so it is claimed. Hound’s tongue is an escaped weed from the early Colonial gardens. It was brought to the United States from the Old World for its medicinal properties. Primarily used for diarrhea and dysentery. But also used for coughs, catarrh, indigestion, colic, chronic bronchitis, neuritis, neuralgia, colds, and lung problems. Externally, used for burns, bruises, scratches, insect bites, snakebites, piles, tumors, scrofula, abrasions, boils, goiters, and difficult wounds, but its effectiveness has been questioned. Culpeper claimed that he cured rabies from the bite of a mad dog with this herb. Use the dried herb or root. Gather the root in spring, the herb in early summer. Infusion: steep 1 tsp. dried root or herb in 1 cup water. Take 1 tbsp. per day. May be sweetened with honey. Do not exceed 1 tbsp. per day dosage, as the plant has marked narcotic tendencies. Hound’s tongue is weakly poisonous and should be taken with care. The plant has marked narcotic tendencies. Contains the potentially carcinogenic alkaloids, cynoglossine and consolidine, both central nervous system depressants. It may also cause dermatitis in susceptible individuals.